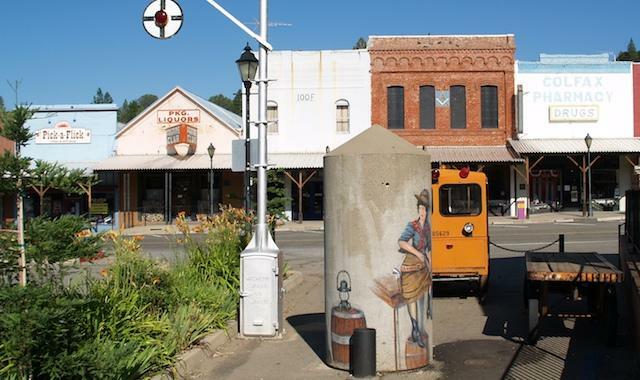 Colfax is a small railroad town in the Sierra foothills on the former Southern Pacific overland route. This town is going to be the centerpiece of my new layout, the Donner Summit. Colfax was at the beginning of the steepest grades on the mountain line and helpers were often added here to eastboun, uphill trains. There was also an interchange with the Nevada County Narrow Gauge Railroad until the narrow gauge line was abondoned in the 40's. Several industries were located here, an oil transfer station, several fruit packing companies and a frieght station. A local train, the Colfax Turn, ran from the division point yard at Roseville to Colfax and switched these industries until the industries shut down. 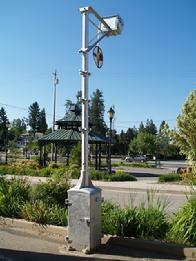 This is one of the few switching oppurtunities to model on the Donner Summit district. Colfax was named after the politician, Shuyler Colfax (March 23, 1823 � January 13, 1885), the seventeenth Vice President of the United States during the Ulysses Grant presidency. Three other towns, one in Washington state, one in Louisiana, and a ghost town in Colorado are also named Colfax, as well as the town of Shuyler, Nebraska, the county seat of Colfax County. 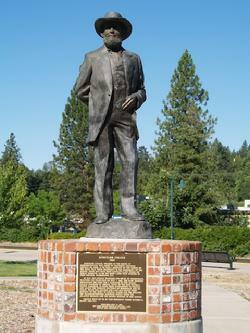 There is a statue of Colfax next to the station which he visited in 1865. 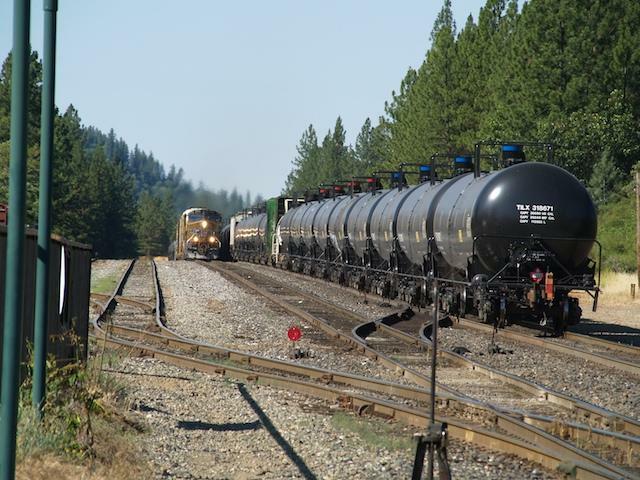 At that time Colfax was the end of the line of the Central Pacific portion of the Transcontinental Railroad. Passengers disembarked after traveling 56 miles from Sacremento and continued the rest of the journey by stagecoach! Even after the railroad was finished Colfax remained a dividing line on the route - prior to Colfax the eastward, uphill ruling grade is 1.50% and after Colfax the grade increases to 2.42% until Emigrant gap where the grade decreases to 1.93% until the eastward summit at elevation 6700 feet. 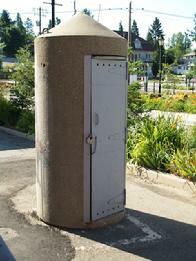 Helpers were often added to trains at Colfax so there was a modest sized engine terminal and crew facilities here. A wye was built for turning engines and can be seen on the satellite view of the town in Google maps. I doubt it used very much anymore although it is possible it could be used for turning snow removal equipment in winter. If anyone knows please email me. 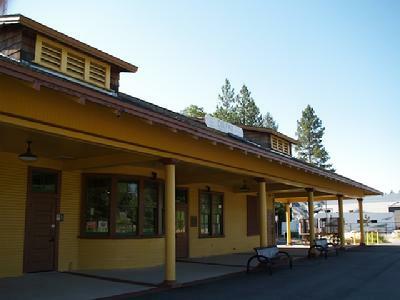 The Colfax depot, built in 1892, is a great example of a colonnade style Southern Pacific station. It has been nicely preserved and is still in use as an Amtrak station. I took a lot of pictures of it this summer on my research trip and I am planning to model it. I have been trying to locate some drawings, or at least some dimensions. The other historic railroad structure still standing in town is the old freight station. I am not sure how much of the current freight station is genuine - it looks too new to be a preserved building to my eye, but it preserves the SP character of the building. Historic downtown Colfax as it appeared on my visit in June 2008. Next to the freight station there are a number of old railroad artifacts including a speeder, a wigwag and a trackside phone booth (pictured to the right). 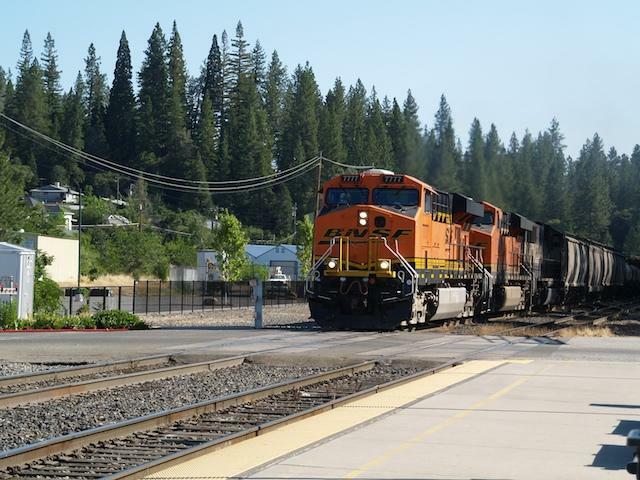 in 1875 a narrow gauge feeder line, the Nevada County Narrow Gauge, was built between Colfax and the gold mining towns to the north, Grass Valley and Nevada City. The tracks ran on the other side of the train station where passengers transfered between lines and from there paralleled the SP mainline until crossing under at Long Ravine and continuing northward. Freight was transfered from broad to narrow gauge cars at a shed just south of the main depot. Just north of town while the tracks were still parallel was a small area called Oilville where oil was transfered and there was also a round table. The last train ran in 1942 after which the tracks were torn up (undoubtedly as scrap for the war effort). If you ever find yourself racing down the I-80 freeway between Reno and Sacremento, be sure to take the Colfax exit and visit this hitoric old town full of railroad history! My plan for Colfax on the new layout. South is up. Click on image for a larger view. Two trains meet at Colfax in June 2008. On the left is the FRED end of a westbound (downhill) train and on the left are three diesels leading an eastward, uphill train. On modern trains enough pulling power is added at Roseville to get the trains over the hill so pusher service has been discontinued. On the left the small yard can be seen. The lead track continues to the left to form a wye. The picture is looking west from the depot. Looking eastward from the station at a westbound train. 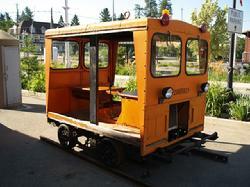 In the center of town is this preserved caboose. 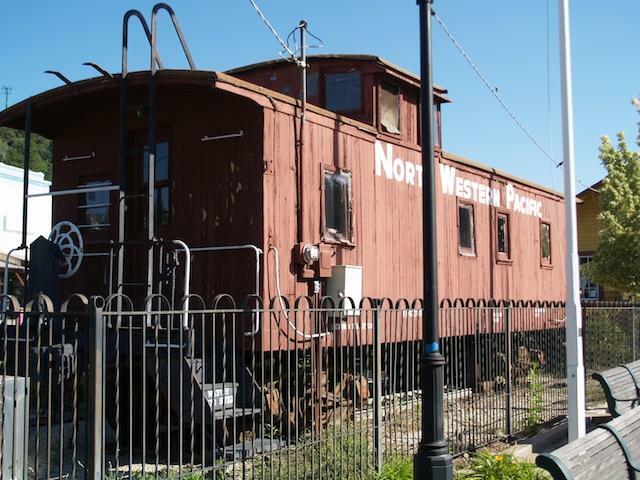 Note the power lines indicating that the caboose is used as a building.